Earlier this month, production began on Universal's The Mummy reboot, which will be the first full-fledged adventure in Universal's monster universe. We got our first glimpse at this unique world in a post credit sequence for 2014's Dracula Untold, where Luke Evans' title character is transported to present day. But, aside from The Mummy, we don't know which project is next in this sprawling universe. One of the movies being included is Van Helsing, and today we have some new details from writer Eric Heisserer. Eric Heisserer came aboard to write the script alongside The Mummy writer Jon Spaihts back in November, but the project still doesn't have a director yet and there is very little we know about the story. Eric Heisserer recently spoke with Hitfix, while promoting the new thriller Lights Out, which he co-wrote, where he revealed that this version of Van Helsing was inspired by another iconic character. Here's what he had to say below. "I can only say that early on, our inspiration for his behavior and his mannerisms was all in Mad Max." 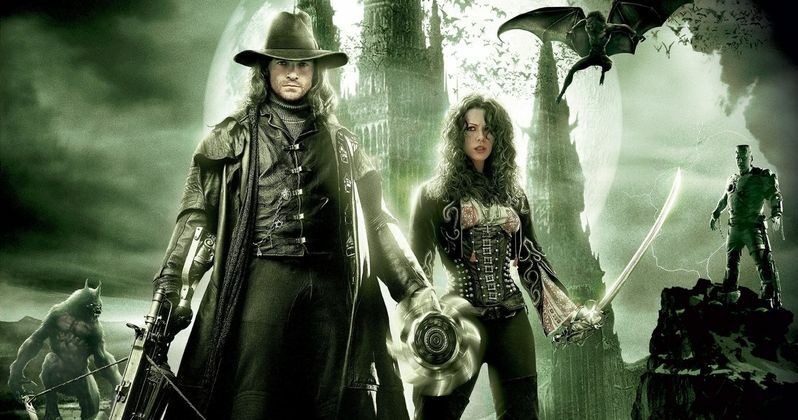 Like all of the properties that will be rebooted within the Universal monster universe, there have been several different big screen iterations of Van Helsing. Edward Van Sloan first portrayed the character in the original 1931 Dracula movie, while Peter Cushing played the iconic character in Hammer Films' Dracula series for several years. The vampire hunter was also played by Anthony Hopkins in 1992's Dracula, Mel Brooks in the comedy spoof Dracula: Dead and Loving It, Christopher Plummer in Dracula 2000 and Hugh Jackman in Universal's 2004 Van Helsing movie. While we still don't know who will play the title character in this Van Helsing remake, Eric Heisserer teased that not all of the Universal reboots will have the same sort of tone. "It's early days right now. I can say that the decision that a lot of us made was to go and just write the best movie we could in our own corner and make sure it's good on its own...and didn't necessarily need to link arm-in arm-with anybody else. And to be tonally different from the other films. One may be a little bit more comedic, action-adventure-y, one can be very much a traditional horror piece. That kind of thing. And then we'll see what happens as the projects evolve and we all get a chance to convene and talk, and make sure the movies feel like they're all in the same world." Universal made headlines earlier this year when they brought on Kingsman: The Secret Service and Star Trek Beyond star Sofia Boutella to play the title character in their Mummy reboot, the first time in franchise history that a female has played The Mummy. When asked if there is the possibility of a gender swap for Van Helsing, Eric Heisserer mentioned that there is already a female Van Helsing in the works, on the small screen. Here's what he had to say, when asked about a female Van Helsing. "Well, I think you're in luck. I think there's a Syfy miniseries, or some sort of series, that comes out that has a female Van Helsing. So that should be interesting." Universal hasn't set a release date for this Van Helsing project quite yet, and they don't have a director attached quite yet either. Alex Kurtzman will produce alongside Roberto Orci and Chris Morgan, but it isn't known when this project may move forward. Universal is also developing a number of other projects such as The Invisible Man starring Johnny Depp, The Wolf Man, Dracula and Frankenstein, among many others. Stay tuned for more on Van Helsing and the rest of this horror movie franchise.